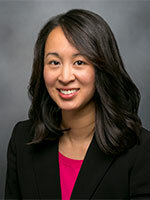 Jennifer Lam, PhD, MPH, is a Postdoctoral Research Fellow at the Kaiser Permanente Northern California Division of Research. She received her bachelor's in English from the University of California, Berkeley, and both her master's in Public Health and doctorate in Epidemiology and International Health from Johns Hopkins University. Dr. Lam has a background in the surveillance and epidemiology of infectious diseases, with a focus on HIV, HPV, and vaccine-preventable diseases. Her current research interests include evaluations of substance use, aging-related conditions, and cancer in populations with HIV.